Janet Dunbar (1973:105) notes that Ham is an ancient village, called Ham-with-Hatch in medieval times and Hamme-juxta-Kyngestone in the 16th century. At that time it would have been merely a cluster of houses at the boundary of Ham Common, with a gate to prevent cattle from straying. 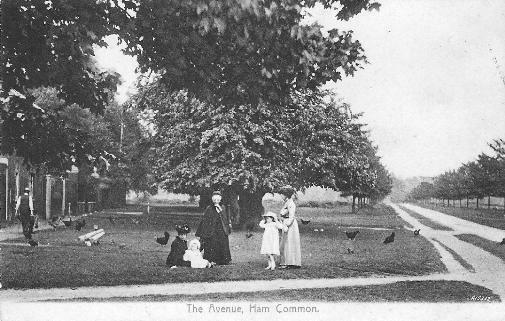 After the construction of Ham House, the Common became more fashionable and several fine houses were built around it. St Andrew's Church was built in 1852. A NEAT LEASEHOLD VILLA, most delightfully situate at the entrance of Ham Common, near Richmond, in Surrey, consisting of a Comfortable FAMILY HOUSE, containing four rooms on each floor, with all requisite offices, and an elegant DETACHED BUILDING in the Garden, consisting of a large sitting room and three sleeping-rooms, with a dressing-room exceedingly convenient, for the SEPARATE ACCOMMODATION of the elder or younger branches of a family; together with coach-houses, stables, pleasure-grounds, kitchen gardens, and rich Meadow, late in the occupation of Capt. GEARY, removing nearer Portsmouth. Eighteen years of the Lease unexpired at Midsummer. - To be viewed till the sale, and particulars may be had at the house, and at the Hobart Arms, Ham Common, at the Star and Garter, Talbot, and Cattle Inns, at Richmond; at the Baptist Coffee-house, Chancery-lane; at Garrawayay's; and of Mr. Willock. Janet Dunbar (1973) A Prospect of Richmond, revised edition, White Lion Publishers.